Hear Ye! Hear Ye! Summer has officially begun, and you’re invited to join the party! 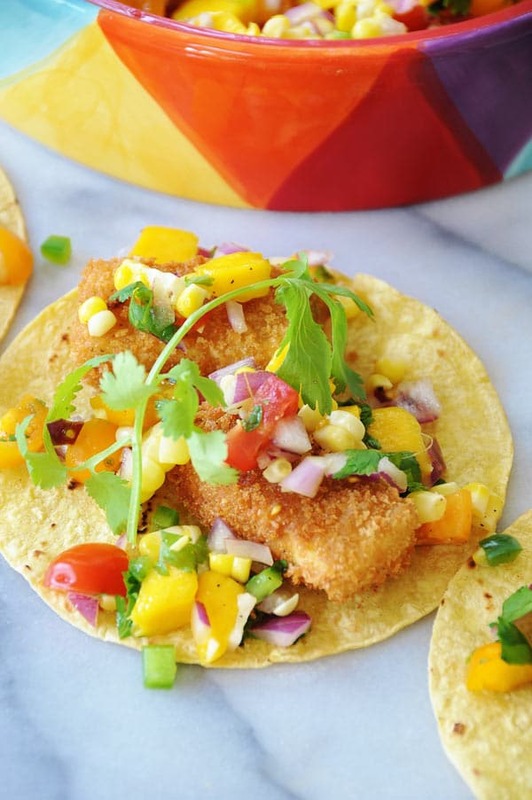 Let’s begin with some of these outrageously crunchy and mind blowing vegan beer battered “fish” tacos with healthy mango salsa. The calendar might say that the first day of summer isn’t for another three weeks and four days, but we all know that Memorial Day is actually the first day of summer. Get out those white jeans and linen shirts and sink your toes into the nearest available beach. Are you in? They were such a hit that I felt obligated to share them with you, so I had to make them again on Sunday. Darn. 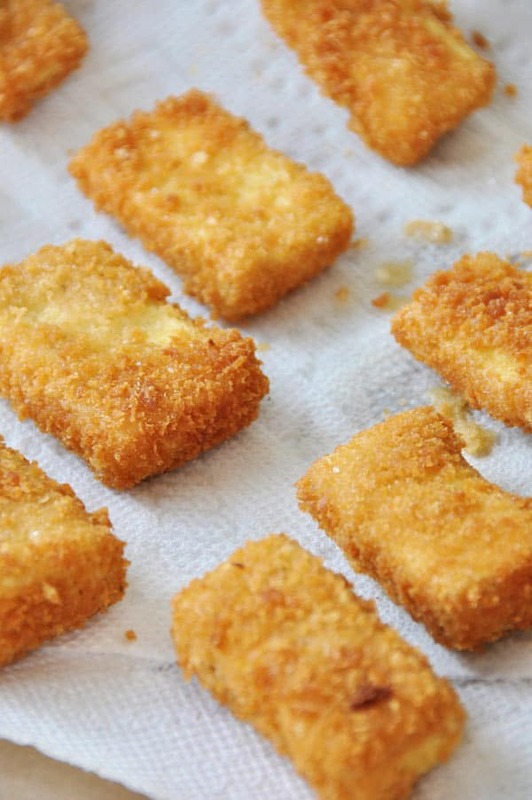 I can already hear the skeptics saying, “tofu cannot taste like fish!” Yes it can. 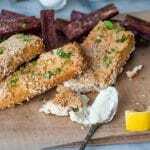 The secret ingredient that makes it taste like fried fish is none other than Old Bay seasoning. You know that fish spice blend that people put in boiled shrimp and crab cakes? Well it also transforms tofu into fish. Abracadabra yo! Now that you know the secret of the flavor of the pringle “fish,” let’s talk about that beer batter crust. Holy moly, this stuff is what dreams are made of if you dream of crunchy stuff. 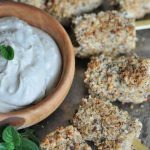 To get this crispy, wonderful beer battered layer of yum you need to start with vegan ale, flour, seasoning, and panko breadcrumbs. Then you start dipping and dredging. Make sure that you buy extra-firm tofu (not silken) and press it for a half hour to drain the excess moisture, then slice it into half inch thick slices. Mine were about two and a half inches long, you can make yours any size you want. When your tofu is ready to go then pour one cup of vegan ale in a bowl, one cup of flour mixed with Old Bay seasoning and salt and pepper in another bowl, and panko bread crumbs in another bowl. Three bowls and three steps to happy fishy free fish. Dip a tofu strip into the beer, dredge it through the flour until it’s completely coated, then dip it into the beer once more, now dredge it through the panko until fully coated and fry it up until it’s golden brown. Drain the excess grease on paper towels. 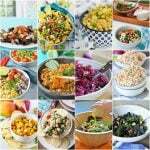 In my opinion you can’t eat fried food without pairing it with something fresh and healthy. It’s all about balance. 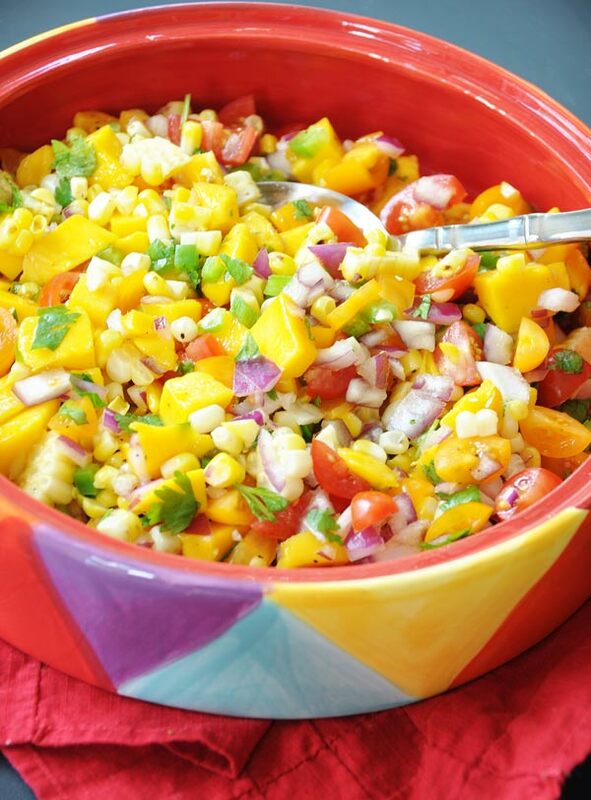 That’s why you’re going to love this mango and grilled corn salsa. 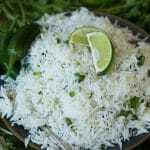 If you want to taste summer, eat some of this. This is a kaleidoscope of deliciousness. 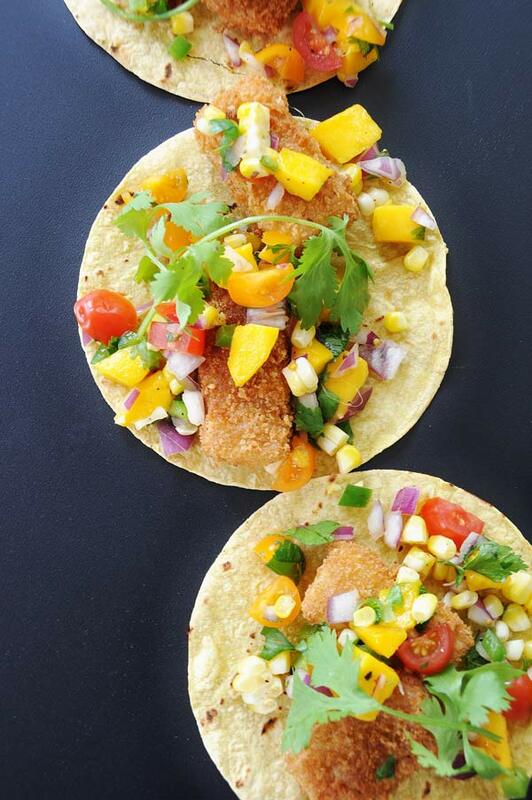 Fresh mango, lime, and cilantro, with sharp red onion and jalapeno pepper, and sweet roasted corn. When this is spooned on top of the beer battered “fish” it tastes like sitting on the shore feels. Heaven. Heat your corn or flour tortillas on the grill, or on the stove top if you don’t have a grill at the ready, and create your masterpiece. And don’t forget to come back and tell me how much you love me for sharing this with you. Mwah! 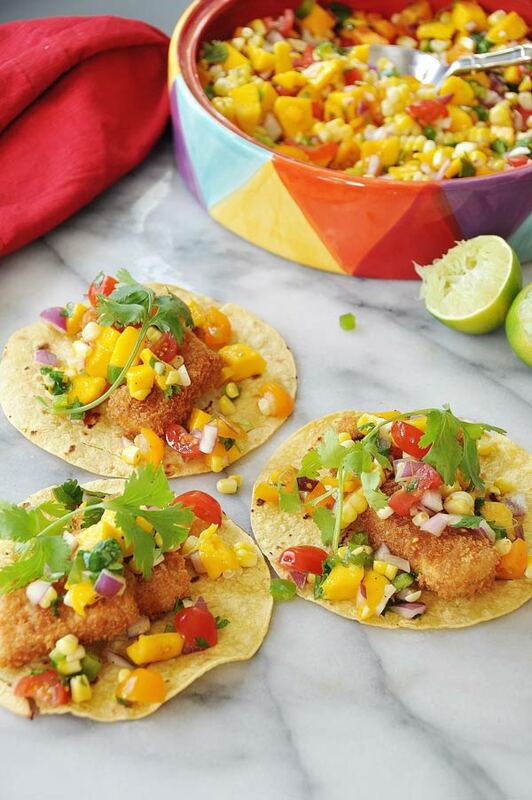 Crunchy "fish" tacos with a bright and fresh mango and grilled corn salsa. Press the tofu between two plates lined with paper towels for twenty minutes and then slice into 1/2 inch thick pieces approximately three inches long and one inch wide. Make the salsa while you press the tofu. Grill the corn until you see grill marks on each side, approximately 20 minutes. Remove the kernels from the cob. Keep the grill hot if you want to grill the tortillas. Peel and cut the flesh of the mango from the core and finely dice. Put in a medium bowl. Add the onion, corn, jalapeno, cilantro, tomatoes, lime juice, and salt and stir well. Put the beer, flour, and panko in three separate bowls. Whisk the Old Bay seasoning and salt into the flour until well combined. Dip the tofu in the flour, then the beer, then dredge in the panko until evenly covered. Place on a plate until all of the tofu is ready to fry. 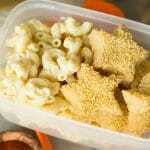 Prepare a paper bag or cookie sheet lined with paper towels to drain the exec oil from the tofu. Put a cup or more of canola oil in a medium skillet, approximately 1-inch (2.5 cm) deep, and heat on medium high heat. When the oil is hot (test with a small piece of tofu, if it bubbles it’s ready), use tongs to place each piece of tofu in the oil. Be careful not to burn yourself. Fry until it’s golden brown, approximately 3 to 5 minutes, and then use the tongs to flip. Fry another 3 to 5 minutes, or until golden brown. Place on the paper towels to drain the excess oil. 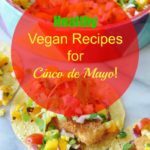 Fill a tortilla with two or three pieces of tofu and top with the salsa. Dont forget to Pin me! Gotta have the Old Bay! Can't wait to try this one too Linda....these recipes all sound amazing. Old Bay is life! Thanks, Nicole!